Mission San Carlos Borroméo. Courtesy of Santa Barbara Mission Archive-Library. 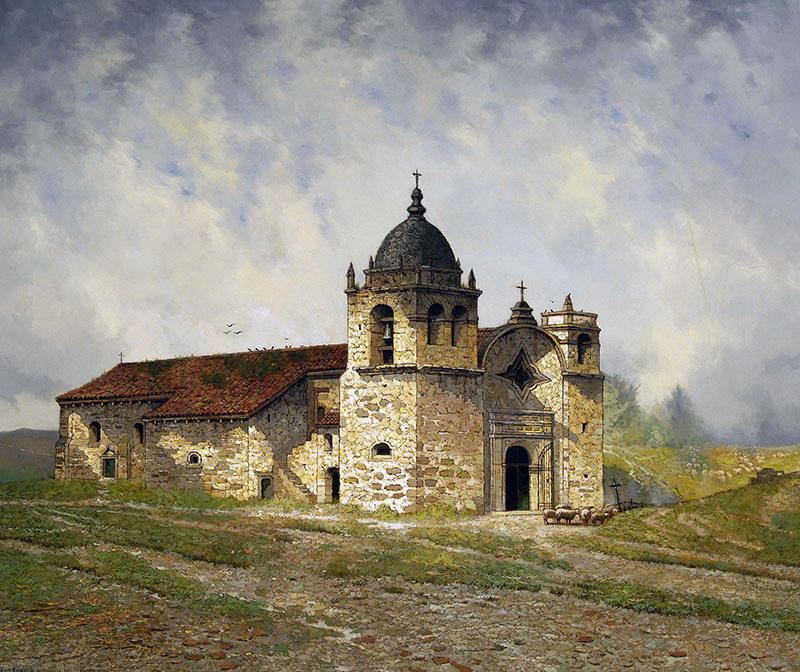 Mission San Carlos Borroméo de Carmelo, also called Mission Carmel, is the second of the mission chain and the personal favorite of Father Junipero Serra. Founded on June 3, 1770, it was named after Saint Charles Borromeo, a 16th-century archbishop of Milan. Fourteen yeas after founding the mission, Father Serra passed away in this bed, and the mission serves as his final resting place. His body, however, has not rested in peace. On four different occasions, his remains have been removed for examination in the process of sainthood. The church at present-day Mission Carmel is a fitting tribute to its founder. Father Serra’s last wish was for a new, stone church to replace the original adobe chapel. It took Father Lasuén fourteen years to fulfill Father Serra’s dream – the new church was completed in 1797. Outside, the mission garden commemorates the 200th anniversary of Father Serra’s death. Near the church is a smaller chapel, frequently used for prayer. Mission Carmel was the center of the mission activity of Junipero Serra, and for this reason, many beautiful artifacts of silver and bronze can be found here. One of the most popular artifacts is the Serra Memorial Cenotaph, made of travertine, marble, and bronze. This monument depicts four missionaries, including Father Serra. All four of the men depicted are buried under the church sanctuary. From the standpoint of government, Mission Carmel was the most important, serving as the headquarters for the entire mission chain from 1770 to 1803. The fathers, though, did take time away from their administrative duties to engage in scholarly works. California’s first library was started here and has grown substantially from the thirty books it contained in 1778. When the missions were secularized in 1834, the fathers lost control of the mission and it fell into disrepair. The land was sold and the mission was neglected for thirty years. The church stood with no roof until restoration efforts began in 1884, bringing this grand structure back to its earlier beauty. Mission Carmel was made a Minor Basilica by Pope John XXII in 1969. His remains examined four times in process of sainthood. From CA-156/CA-1: South of Monterey, exit onto Rio Road and travel west. Monday - Saturday 9:30a - 5:00p and Sunday 10:30a - 5:00p; closed Easter Sunday and Monday, Thanksgiving, and December 24 through 26. Please call 831-624-1271 for further information. Mora Gallery, Downie Museum, Munras Museum, Convento Museum, and special exhibitions. Please call 831-624-1271. Weddings. Please call 831-624-1271 for information.